Zambia is a peaceful landlocked country in Southern Africa with stunning natural beauty and a warm, welcoming culture. After its independence in 1964, the country became one of the fastest growing economies in Africa. Over fifty years later, however, Zambia is still suffering from high levels of poverty and inequality in part caused by two decades of floods, severe droughts, and a devastating AIDS epidemic. More than 80% of the rural population lives below the poverty line, of which 63% struggle to live on less than $1.25 per day. Many rural families rely on subsistence farming and with limited access to farming inputs, credit or savings. Chronic food insecurity and malnutrition is widespread. Lack of access to adequate food and clean water stunts nearly half of Zambian children under 5 years old. During the "hungry season," when food is scarce, many families eat only one meal a day. 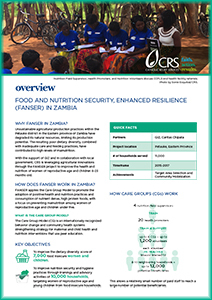 CRS Zambia works with its partners to strengthen community resilience to these shocks as well as to alleviate the underlying causes of chronic hunger, poverty and poor health. 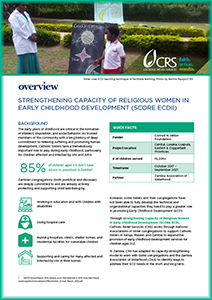 CRS Zambia implements programs in partnership with a variety of stakeholders, including the local church, faith based institutions, local organizations and in collaboration with the Government of Zambia. Our current work in Zambia focuses on the following areas: Nutrition Sensitive Agriculture & Livelihoods, Water, Hygiene and Sanitation, HIV / AIDS, Health Systems Strengthening, Microsavings, Orphans and Vulnerable Children and Early Childhood Development programming. 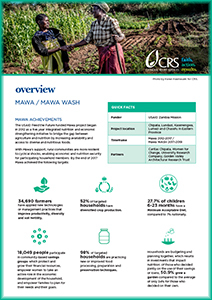 To prevent stunting, a CRS project helps mothers care for themselves and their children. Reluctant but desperate farmers see increased yields and better market connections. 800 participants link technology to impact at the ICT4D conference in Zambia. Full results announced at the 2018 ICT4D conference on May 8-10 in Lusaka, Zambia. 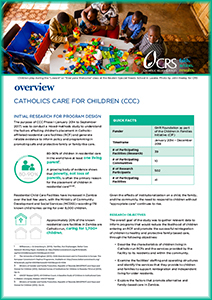 Catholic Relief Services began working in Zambia in 2000 by invitation of the Zambian Conference of Catholic Bishops. 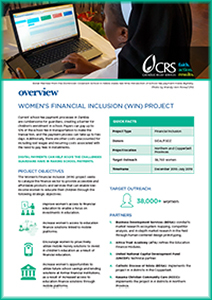 Our initial work included strengthening and enhancing partnerships with the local church and development partners, and supporting community development initiatives in Zambia. 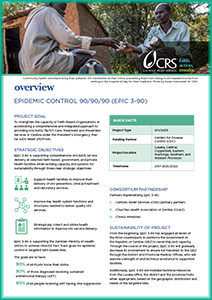 What had started as a small, privately-funded program has grown into a complex country program in response to the variety of shocks over the past two decades.